What Day Of The Week Was April 5? 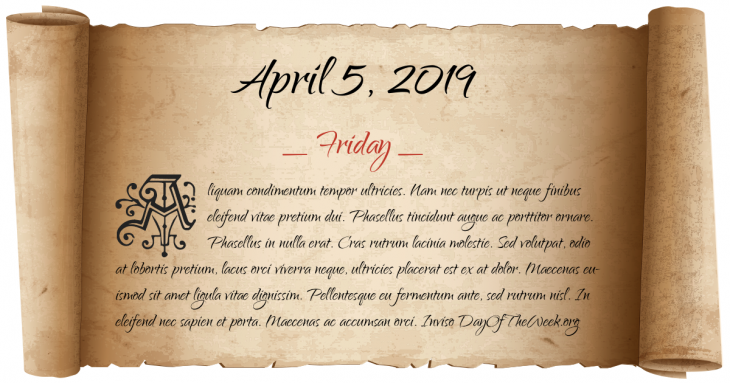 April 5, 2019 was the 95th day of the year 2019 in the Gregorian calendar. There were 270 days remaining until the end of the year. The day of the week was Friday. The Dutch explorer Jacob Roggeveen discovers Easter Island. Birkenhead Park, the first civic public park, is opened in Birkenhead. World War II: American bomber aircraft accidentally cause more than 900 civilian deaths, including 209 children, and 1300 wounded among the civilian population of the Belgian town of Mortsel. The target is the Erla factory one kilometer from the residential area hit. Soviet troops leave the island of Bornholm, Denmark after an 11 month occupation. Alberto Fujimori, president of Peru, dissolves the Peruvian congress by military force. The Siege of Sarajevo begins when Serb paramilitaries murder peace protesters Suada Dilberovic and Olga Sučić on the Vrbanja Bridge. Georgia establishes a Provisional Administrative Entity in the disputed region of South Ossetia. Twenty-nine coal miners are killed in an explosion at the Upper Big Branch Mine in West Virginia. Who were born on April 5?